As is generally the case with any illness, we want to consider the cause of the illness as well as the most urgent manifest symptoms. There are many possible causes of toothache. Let us consider for this article one that is undoubtedly a major cause – infection. Obviously, if infection is causing a toothache, we want to address the infection with antimicrobial agents. Most of our DIY toothache remedies have some antimicrobial properties. Barberry (Berberis spp.) will be discussed in this article, though it represents others of the group that are also quite useful and most better-known; such as Goldenseal (Hydrastis canadensis), Oregon Grape Root (Mahonia spp. ), and Goldthread (Coptis spp.). Spilanthes is also a stellar antimicrobial. It will be discussed here additionally because it has numbing and sialagogue properties – a perfect toothache herb. Another classic remedy that must be mentioned is Clove (Syzygium aromaticum), usually used as essential (distilled) oil. Sesame (Sesamum indicum) oil, or another cooking oil, can be used in a remedy called oil-pulling. And the fifth remedy is the technique of shiatsu (acupressure). There are many additional DIY remedies that can be found outside in various ecosystems. It is well worth getting to know your local forests and camping areas in case the need arises to find a toothache remedy. Toothache is some of the worst pain I have experienced. It can keep a person awake at night and feeling very miserable. If you are in the woods or otherwise away from medical care or even your home medicine cabinet, there will likely be many herbal remedies found at hand among the plant life. Trees in particular offer many toothache remedies. 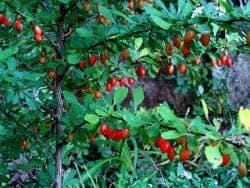 Prickly Ash in certain areas is a helpful remedy. More wide-spread are the conifers. Pines, Spruce, Fir, and others produce resins that can be very helpful. Myrrh is another tree resin well-known for treating toothache. Willlows and Poplars as well are well-known pain relieving herbs. Among the herbaceous plants there are things like the Mints, Yarrow, and other aromatic and/or antimicrobial plants. A study in toothache remedies, however abundant they are, might best start with the five classic remedies mentioned above. 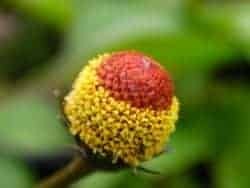 Toothache plant is also commonly known by its genus name Spilanthes and by the name Eyeball Plant, for the flowerhead which lacks rays. It is largely a tropical plant, where it often grows as a perennial. In my part of the world, we grow Spilanthes as an annual. I think of it as a quick-growing Echinacea analogue, as Echinacea takes several seasons to mature. Like Echinacea, or Cone Flower, Toothache Plant produces a distinct tingling as well as an increased flow of saliva. If you are lucky enough to have fresh Toothache Plant growing (or smart enough to have planted it), simply pick a flower-head and chew it, or at least bite into it once or twice before stuffing it between your gum and cheek (or maybe under the tongue) near the troubled tooth. If you do grow Toothache Plant you can tincture it by chopping and soaking the plant (or just the flower heads) in high-proof alcohol. After about four weeks (one moon cycle) you can strain the liquid off (perhaps by pouring through and then ringing out through cheesecloth) and store in a tightly sealed jar. If dispensed from a one or two ounce bottle with a dropper lid, it is easy to drop from a few drops to half the dropper directly onto the trouble area. The tingling effects from Toothache plant are quite immediate and strong in effect. In fact, it can be overwhelming. If you place too much tincture in your mouth or chew a bit too much of a flower-head, you might find your mouth producing almost more saliva than you can swallow. Here-in lies some of the benefit, however. Spilanthes helps to move the saliva and lymph and “wash out” the sick fluids around the tooth. Additionally, Toothache Plant is a distinct antimicrobial. It quickly helps to resolve the infection that is at the root of the pain. Even the Hagakure – “The Book of the Samurai” mentions the protective and healing powers of clove. Still today Clove is revered for its medicinal uses, and is known as a primary remedy for tooth pain. Aromatherapists, herb shops, and distributors of essential oils have promoted especially the essential oil of Clove for toothache, and it is indeed a convenient remedy. 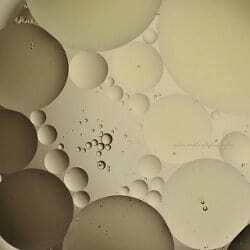 The distilled oil is liquid and usually sold in small bottles with a dropper. Simply place a drop or two on your finger to apply or apply directly from the dropper onto the trouble area. 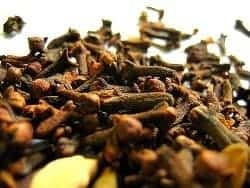 Clove is quite spicy and warming and will cause the tissue to burn. Don’t use so much as to cause excessive irritation. This burning sensation and warming of the tissue is in part what distracts one from the pain. There is a numbing quality as well, and Clove has antimicrobial properties. 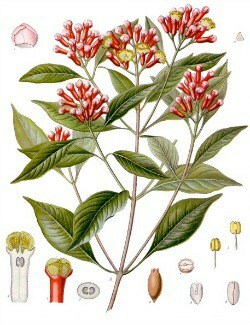 Clove essential oil can be mixed with other essential oils, like Tea Tree (Melaleuca). Tea Tree is a wonderful antiseptic, though I am not real fond of putting it in my mouth. It’s antiseptic properties are undeniable and for this reason I usually have some around, particularly for tick bites but also as a general antiseptic for cuts and the like. Since you should have some around in your first-aid kit (I keep it in my truck, home, cabin, and even motorcycle saddlebags), it is well worth considering as a toothache remedy, especially mixed with Clove. Clove oil or combination of oils can be mixed in with the oil used for oil pulling, described below. It is also used in sword oils, for tending to the shinken or katana (sword). So, depending on what type of survival situation you are preparing for, there are many possible reasons to have Clove oil around. It can also be useful for digestive, respiratory, and circulatory problems, headaches, and in the treatment of injury. Powdered Clove can easily be used by placing a pinch in the troubled area. It can also be infused into oils, though you would want to allow more time for the oil to extract the medicine from the powder than when using the essential oil. Even more time should be allowed if using whole Cloves. Quite likely, you will want to grind them if you have only whole Cloves. For storage purposes, whole Cloves might be prefered to the powder because of their longer shelf-life. Oil pulling consists of swishing oil, such as Sesame oil, through the teeth and around the mouth in order to absorb the impurities of the mouth and gums. Any oil will do. Simply swish until your saliva has thoroughly been mixed with the oil and then some, about 15 to 20 minutes. Then spit it out. Repeat for acute toothaches. Practice daily to avoid toothaches or for minor ones. Sesame oil is a commonly used oil, partially because Sesame has been used to strengthen the bones and teeth. Of course today using Coconut oil is very popular. In many areas Olive oil will be the most available. Grapeseed oil is good too. For an active infection, you can consider adding small amounts of clove oil, tea tree oil, or other antimicrobial oils. Shiatsu (Japanese for “finger pressure”), or acupressure, is also very good for toothache. There are some points locally – some in the jaw for any toothache, and of course some might be of particular focus according to which tooth is affected. There are also some points around the base of the skull, neck, and shoulders that help, partially by releasing the tension that often accompanies, and contributes to, tooth pain. There are also distal points that are located elsewhere on the body. A primary distal point for toothache is between the thumb knuckle and metatarsal bone of the index finger. There is more-or-less a muscular mound that when pressed will usually be quite sore. The point and general area can be pressed or massaged. Most of the other relevant points can be simply felt out by massaging the area of the jaw, occiput, neck, and shoulders. Especially the joint of the jaw, the muscle there, and the area around the teeth should be palpated for soreness and pressed or massaged. Likewise, the base of the skull, the neck (especially the muscles and along the spine), and the tops of the shoulders should be rubbed and palpated. There is one point in particular worth mentioning (the rest have to be saved for an article specifically on the subject). It can be found by working one’s fingers along the base of the skull. Although everyone is built a little different, there is usually a soft, and sore, spot between a mound behind the ear and a mound at the back of the neck. By treating this point with pressure or massage it is possible to relax the whole neck, jaw, and shoulders and bring great relief to the pain. This post is for informational purposes only. Please consult your local physician if you have a real medical issue such as a toothache. The author is not a medical professional and does not make any claim to be one. Interested in writing for us? Send a sample of your work and an introductory statement to joel@survivalcache.com. Please use subject line: ‘Write for SurvivalCache/SHTFBlog’. If you’re a good fit, we’ll publish your work and compensate you accordingly.